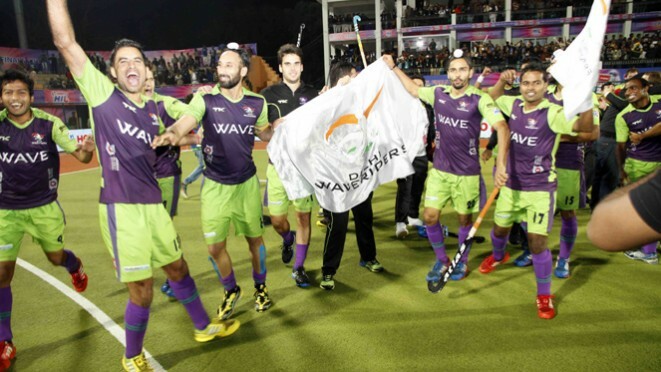 Ranchi, February 23: Sardar Singh-led, Delhi Waveriders emerged the Champions of Hero Hockey India League post an exciting game of hockey which was both intense and nail biting. They were successful in keeping their nerves intact to beat Jaypee Punjab Warriors in the penalty shoot-out and emerge as the contenders to lift the glittering trophy at the Astroturf Hocket Stadium in Ranchi. The Grand Finale of Hero Hockey India League even witnessed the presence of many eminent dignitaries at Ranchi today. FIH President, Mr. Leandro Negre was seen in the VIP box alongwith FIH CEO, Mr Kelly Fairweather. Also present for the occasion was Mr. Rajiv Shukla, Member Governing Council, Hero Hockey India League and Minister of State for Parliamentary Affairs, Mr. Arun Jaitley, Member Governing Council, Hero Hockey India League and Leader of Opposition, Rajya Sabha, Dr Narinder Batra, Chairman, Hero Hockey India League, Mr. Rajeev Mehta, Associate Vice President, Hero Hockey India League and Secretary General, IOA. Delhi Waveriders rode on goalkeeper Nicolas Jacobi’s brilliant show ubder the bar to eke out a hard-fought 3-1 win over Jaypee Punjab Warriors in the shoot-out after the two teams ended the regulation time locked at 3-3.